Morning dress is the daytime formal dress code, consisting chiefly of, for men, a morning coat, waistcoat, and striped trousers, and an appropriate dress for women. Men may also wear a popular variant where all parts (morning coat, waistcoat and trousers) are the same colour and material, often grey and usually called 'morning grey' to distinguish it; this is only properly appropriate to weddings and races and is known as a morning suit. The semi-formal counterpart of this code is the stroller. Morning dress is now rarely worn as anything other than formal wear, as a form of civic dress, e.g., by provincial mayors (as an alternative to court dress), but more generally only for weddings, some official civic, governmental or royal functions, 'social season' events, e.g., races such as Royal Ascot (where it is obligatory in the Royal Enclosure) and at Epsom in the Queen's Stand on Derby Day, formal lunches (especially those in the City of London institutions, notably of the livery companies and guilds) and as uniform at some of Britain's most traditional schools such as Eton. It will also be seen sometimes worn at services in St Paul's Cathedral, London and St Giles' Cathedral, Edinburgh. a waistcoat, at formal events this is black and matches the material of the coat; at funerals mourners and undertakers usually are dressed as such and this has led to confusion as termed mourning dress and also, but rarely, with additional white slips. If the trouser cloth matches the coat, the ensemble becomes a morning suit. The waistcoat may also match, or not (an "odd waistcoat"). Morning suits will sometimes be a middle-tone gray. Morning suits, especially the lighter-toned ones, are considered slightly less formal than morning coat ensembles. The morning coat can be black or Oxford grey herringbone wool with the tails of knee length. The formal ('spongebag') trousers worn with it are either 'cashmere' striped, or black and white checked. The most traditional colours for a waistcoat are grey, buff (a yellowish tan colour), or black. A black morning coat with matching black waistcoat is the most formal option, being worn for funerals, memorial services, civic dress and diplomatic dress (replacing or supplementing Court Dress), with academic dress, or in government use in America. At social or festive occasions, e.g. races and weddings, a contrasting waistcoat is worn, usually dove grey, pearl grey, or sometimes buff, although there has been a tendency towards 'fancy' waistcoats of multicoloured and embroidered materials. Other colours sold by traditional English tailors include powder blue and a pale pink. Generally, traditional waistcoats are made from wool or linen. Waistcoats may be either single-breasted with, or without, lapels or double-breasted with lapels. Single-breasted models with lapels usually feature a step collar, whilst double-breasted models commonly have either a shawl collar or a peak lapel. Sometimes a white slip is worn, which is a strip of fabric buttoned to the inside top of the waistcoat to simulate the effect of a paler under-waistcoat, though the actual wearing of two waistcoats was obsolete even for the late Victorians. Formal trousers should not have turn-ups (cuffs in American English), and should have one or two forward pleats to each leg. Braces (suspenders in American English) should be worn to prevent the waistband from appearing beneath the waistcoat. Belts should not be worn with morning dress. Less common alternatives to striped trousers are houndstooth check, and grey flannel trousers, amongst others. A white stiff collar is traditional, with the plain turn-down cutaway variety standard since the World War II; in this case a normal long tie is worn. Otherwise, a wing collar may be worn; the combination of long tie and wing collar is very dated, so these are paired with an Ascot, though even this has acquired negative connotations as dress hire companies used pre-tied or incorrect patterns for many years which has caused the configuration to be seen as an inferior or hired look. Because of this Debrett's, for example, considers the Ascot and wing collar inappropriate for weddings or morning dress. If the shirt has turn-down collars it usually has sleeves with double cuffs fastened with cufflinks as standard. If a wing collar is worn it should be with a single cuff shirt as in the past a starched stiff fronted shirt was worn with the cuffs also starched stiff as well as a starched detachable wing collar, worn with cufflinks and shirt studs (essentially, the same as the full evening dress shirt). Contemporary shirts often do not have a detachable collar at all. The most formal colour for a shirt is white, but if a coloured or striped shirt is worn, it should have contrasting white collar (and possibly cuffs). Traditional formal colourings are Wedgwood blue, solid or in thin vertical stripes. Previously, a grey or (if at a funeral) a black neck-tie was obligatory. Now all colours are worn; in many clubs and societies the Club Tie is acceptable to distinguish members from guests at formal lunches and breakfasts. The original silver Macclesfield design (a small check) is still used particularly with cravats, and is often called a wedding tie. The English etiquette authority, Debrett's, dictate that [smart woven silk] ties are preferred to cravats. Bow ties may be worn as an alternative to the necktie. Given that black bow ties are associated with black tie and white bow ties are associated with white tie, it may be sensible to consider other colours or tones. Cravats are another alternative and may be tied in a formal dress knot (Ascot knot) which is secured with a cravat pin, or a slightly less formal ruched knot which resembles a four-in-hand tie. Cravats are no longer permitted to be worn in the Royal Enclosure at the Royal Ascot, which has been stipulated since 2012. Note: members of the British Royal Family are never seen in photographs wearing waistcoats and ties that match one another. Shoes should be of the traditional, highly polished black plain cap-toe Oxford type without brogueing, but not patent leather which is now reserved for evening formal wear. It is not ideal to wear open-laced shoes, such as derby shoes (or bluchers in American English). In the Victorian and Edwardian era button boots and Oxford boots were worn and these can be correctly worn with morning dress today. When worn at equestrian events, boots of equestrian origin such as jodhpur boots, George boots and Chelsea boots are also acceptable. Spats were once frequently seen with morning dress, but are now rarely worn. In respect of ties and pocket squares, it is considered particular elegant to pair one of those accessories, which is made from silk, with the other, made from a non-lustrous material such as linen or cotton. This helps to counterbalance the potential for affectations. Although it is very common practise in wedding parties, many style authorities do not recommend matching a pocket square to a tie as it tends to look contrived, draw attention away from the wearer's face, and display sartorial uncertainty. Pocket squares with a solid colour should generally be paired with a patterned tie (and vice versa) and should not share the same base colour. If the pocket square is patterned, it should likewise not match the tie but instead complement it. 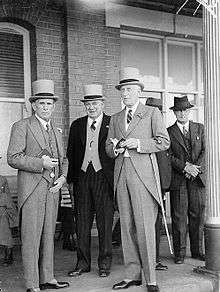 Slightly less formal, a morning suit can be worn, which has mid-grey matching morning coat, waistcoat, and trousers (all cut the same as above); being more relaxed, this is a traditional option for events in less formal settings such as Royal Ascot, and is now often worn to weddings as well. For more details on this topic, see Scottish apparel. White tie is the correct, equivalent formal dress for evening social events. The cutaway front of the morning tail coat differs from the evening tail coat (dress coat) in that the waist of the former is cut obliquely while the waist of the latter is cut horizontally, and the tail is cut differently from the swallow tailcoat used for evening dress. The skirt waist construction of the coats is equestrian in origin, to ease the wearer's riding his horse. In the U.S., the morning coat is sometimes referred to as a cutaway coat. In Britain, morning dress is worn to certain equestrian events (such as Royal Ascot and The Derby). It is also worn, both in British Commonwealth countries such as Australia and New Zealand, by the male members of a wedding party. Men at Upper and Middle class weddings usually wear their own morning coats and their own ties. On these occasions they may wear their old school ties. 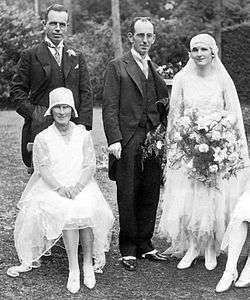 It is currently popular in the British Working class (constituting the majority of the population) for only the 'wedding party' to wear morning 'suits'. These tend to be hired and far more 'co-ordinated' than those worn by their upper-middle and upper-class counterparts. The men usually dress in identical, hired, outfits along with identical ties, handkerchiefs and waistcoats. In Europe, the groom sets the sartorial tone: the guests may wear morning dress if he does. In the U.S., morning dress is rare; it usually is worn in traditional weddings and political formal events, although the Reagan inauguration of 1981 was the last use for that ceremony. In the American South, morning dress is commonly worn by a governor-elect when sworn to office. The United States Solicitor General and deputies wear morning coats during oral argument before the United States Supreme Court, as do the Marshal and Clerk of the court during all sessions of the court, unless they are female. ↑ "Morning Suits - Cad & the Dandy". ↑ "Wedding Suits - A Suit That Fits". ↑ "Morning Dress, Dress Codes, A to H, British Behaviour, Etiquette and Style | Debrett's". www.debretts.com. Retrieved 2016-05-30. ↑ "Royal Ascot Style Guide | Ascot". www.ascot.co.uk. Retrieved 2016-05-30. ↑ Wyse, Elizabeth (2015). Debrett's Handbook. Mayfair, London, United Kingdom: Debrett's Limited. pp. 436–437. ISBN 978-0-9929348-1-1. ↑ Elsie Burch Donald (1981). Debrett's Etiquette and Modern Manners. p. 56. ISBN 0-7472-0657-0. ↑ "Inauguration of President Ronald Wilson Reagan, 1981". Inaugural.senate.gov. 1981-01-20. Retrieved 2012-06-18. ↑ "William Suter, Clerk of the U.S. Supreme Court, interview, C-SPAN U.S. Supreme Court Week". Supremecourt.c-span.org. Retrieved 2012-06-18. ↑ See also depictions in Puttin' on the Ritz. Wikimedia Commons has media related to Morning dress.